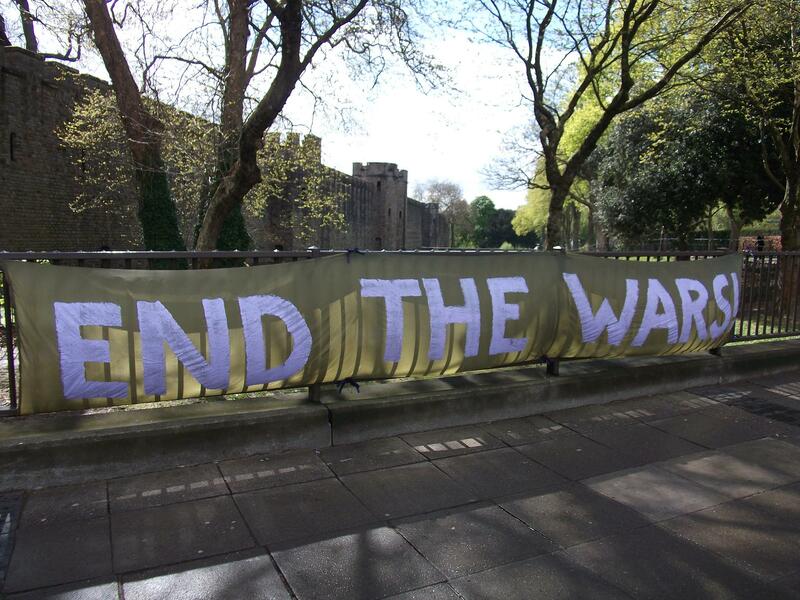 Here are some photos of what we’ve been doing in Cardiff over the past week in connection with Bradley Manning. 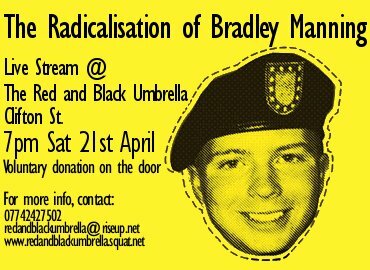 Solidarity events continue Tuesday 24 April in Cardiff on the first day of Bradley’s next court hearing (also London and Fairford). See also our previous reports from Pembrokeshire and first night in Cardiff with Craig Murray and Guy Smallman. See also this report on indymedia. 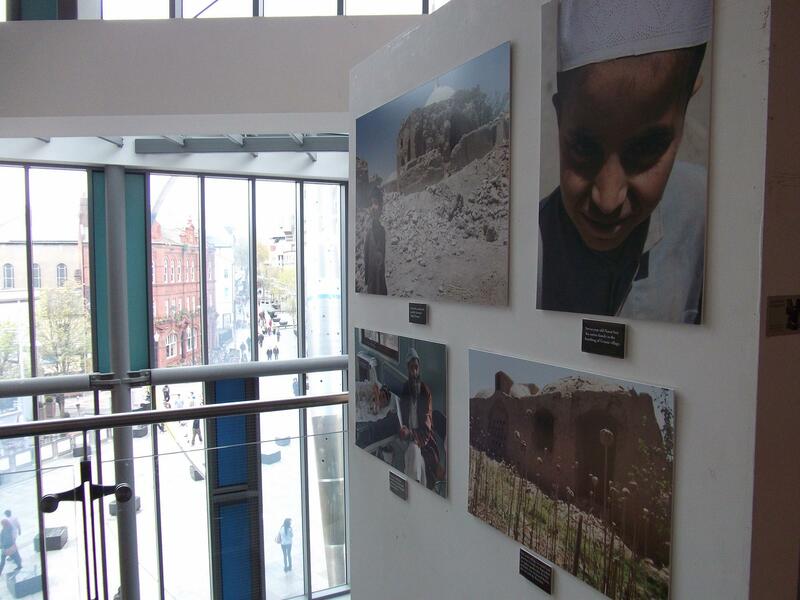 We’ve been at the library most days talking with folk about Guy Smallman’s photos of Afghanistan. 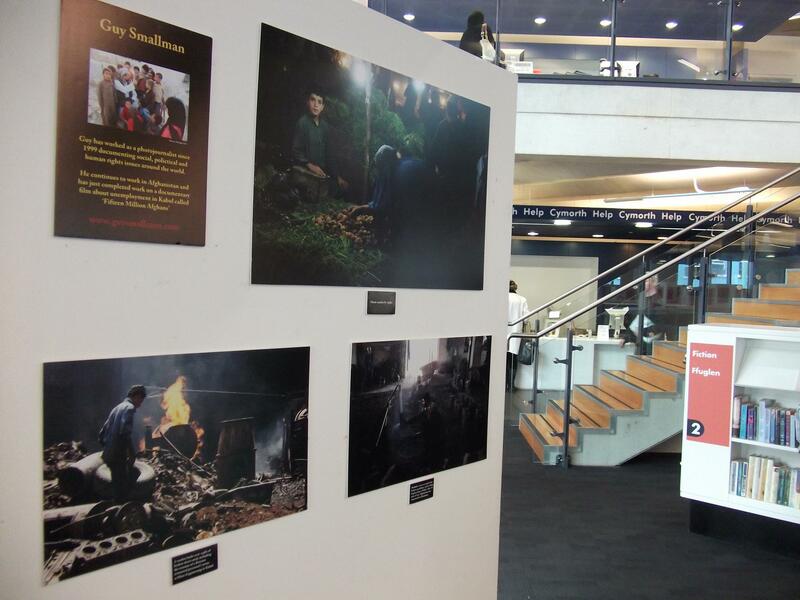 The exhibition looks great – powerful images, lovely light, in a great location in the library and attracting lots of interest from library users, including many of middle eastern origin. We’ve had a lot of conversations about Bradley Manning too, with people who already know his story and want to discuss his mistreatment to those who’ve never heard his name before. 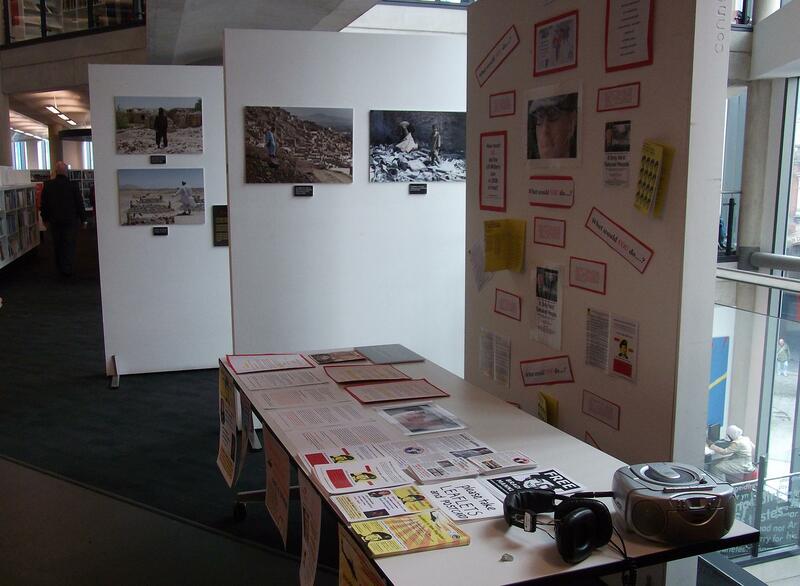 The exhibition includes a tape recording of Bradley Manning ‘in his own words’ containing extracts from the chat logs released by Adrian Lamo. 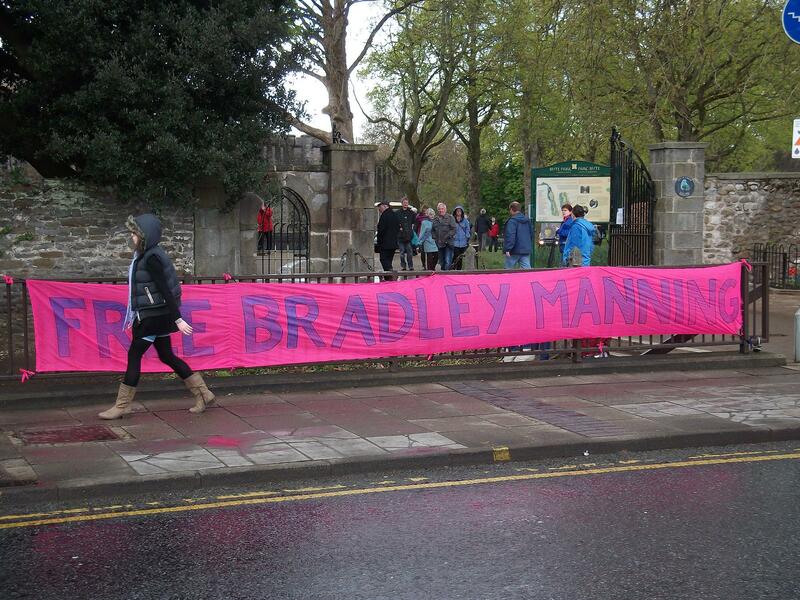 The picture above does not imply any support for Bradley Manning from the organisation ‘Chapter Arts’. We spent a morning at Chapter Arts in Canton, although their enthusiasm for our presence was apparently a mistake – they thought we were promoting NTW’s performances of ‘The Radicalisation of Bradley Manning’ and weren’t nearly so keen on us promoting our solidarity events (which include the sort of arts events we’d have thought Chapter would be happy to promote) alongside the play. 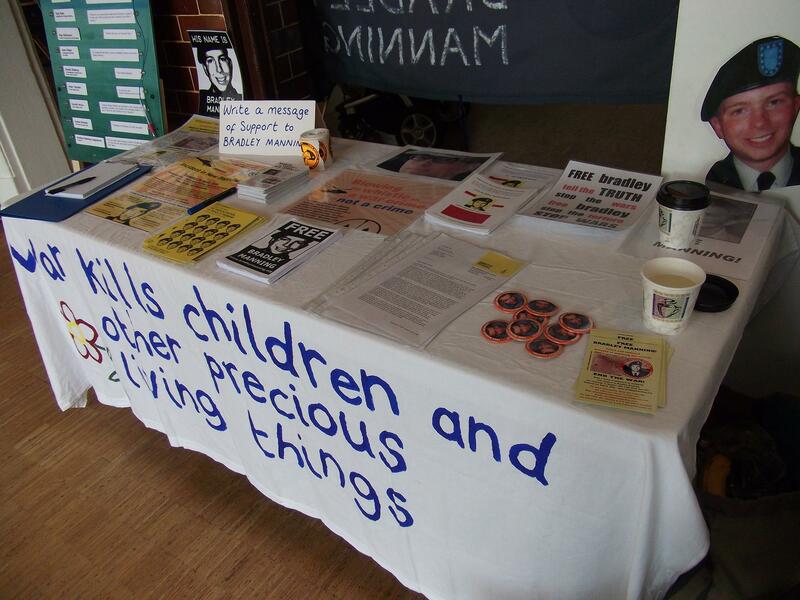 It was at the point that we spread our tablecloth decorated with ‘War kills children and other precious living things’ that they decided we weren’t welcome, although they graciously allowed us to stay in the foyer all morning and only occasionally queried when we would be leaving. It was still school holidays, so we had a lot of children passing by. 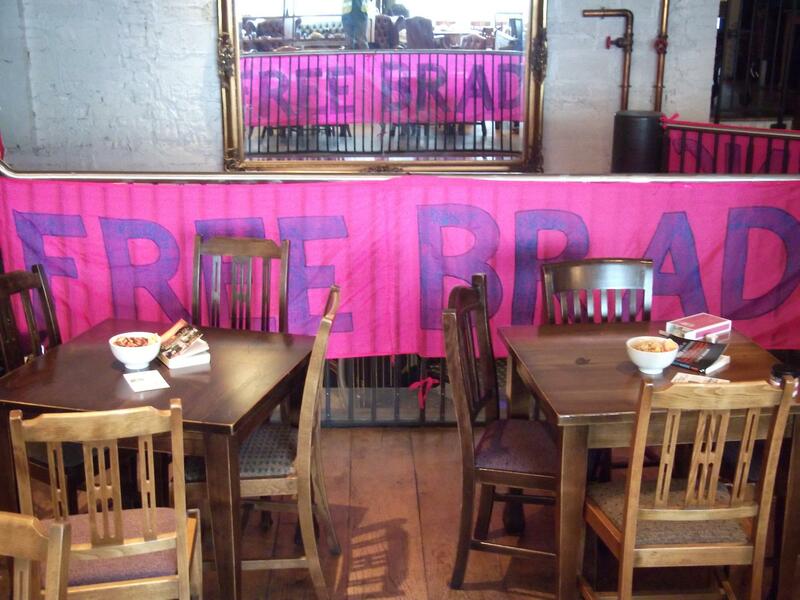 People wrote letters of solidarity to Bradley, others tried their hand at the quiz, took flyers and stopped to talk. 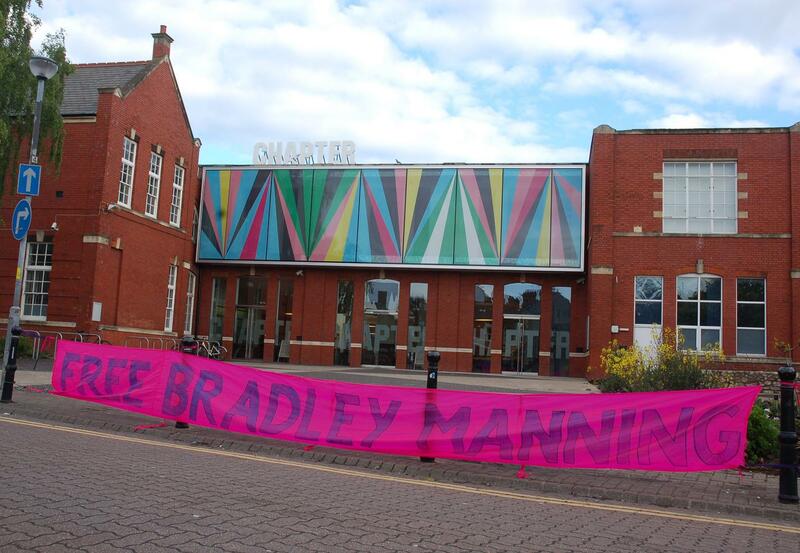 We’ve been at the play ‘The Radicalisation of Bradley Manning’ after every public performance, handing out flyers and stickers and talking with anyone who feels inclined to stop and share their thoughts. Reactions to the play have been overwhelmingly positive. We’ve been handing out CND Cymru’s bilingual briefing paper on Bradley Manning to anyone who’s asked for more information. We hope that some of the concern translates into support and solidarity in the coming weeks and months of the court martial. 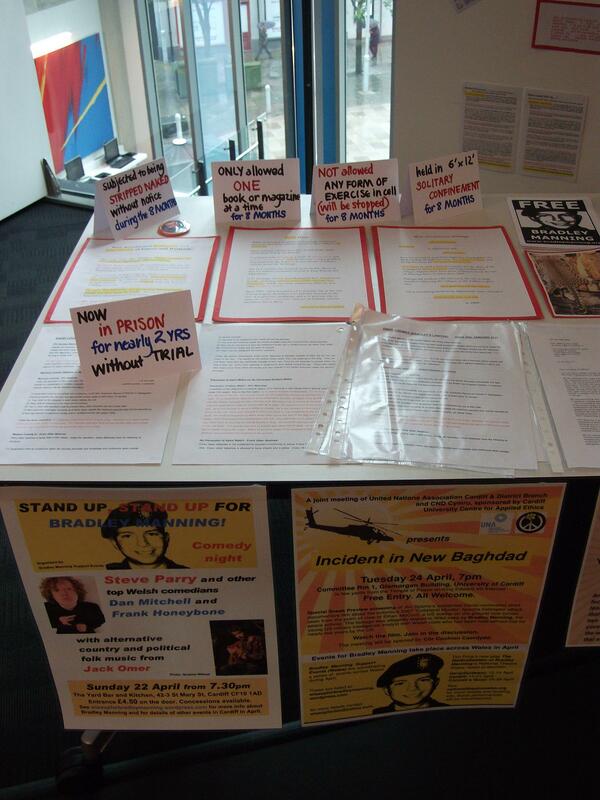 On Saturday, two of us spent the day at the Campaign Against Arms Trade regional meeting where we had a stall for Bradley Manning. People took information, signed up for the WISE Up email list https://lists.riseup.net/www/info/wiseupforbradleymanning and wrote solidarity letters to Bradley. 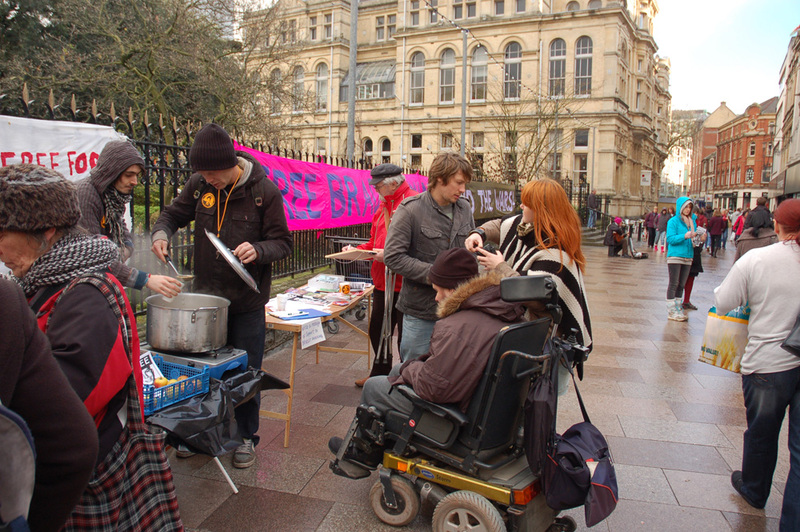 On Tuesday 24th, we’ll be in Cardiff city centre outside Central Market from midday with a Free Food, Free Bradley Manning! stall on the day that Bradley’s next pre-trial ‘motions’ hearing begins at Fort Meade, Maryland. In the evening, there will be a screening of Jim Spione’s Oscar nominated short documentary film based on the ‘Collateral Murder’ attack: ‘Incident in New Baghdad’ at the University followed by discussion. The final leg of our solidarity tour starts Wednesday when we head up to north Wales as the play opens in Connah’s Quay. 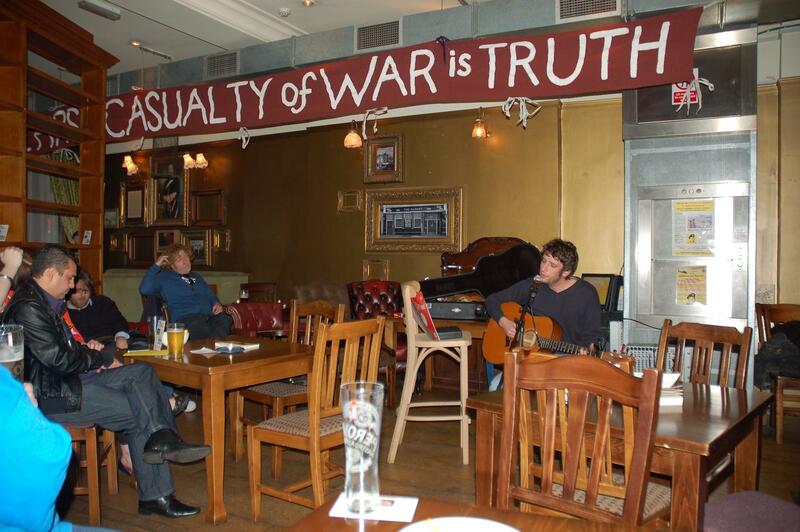 There’s a meeting for and about whistleblowing in Denbigh on Friday and a gig for Bradley in Wrexham on Sunday.